Rare visitor, old timer Mr. Zhao (formerly XU8CA, now silent key) from Hangzhou, China. 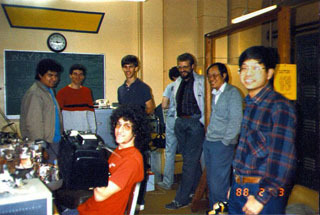 Club Meeting 1988. Club President Bob Maxwell (WB6LHO) with 52 active club members! 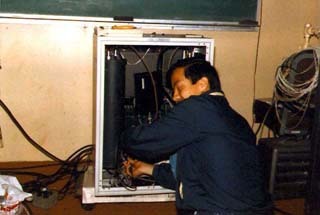 Pat Kudo (N6GTU, Club President 1985–86) putting up the first Club 440 MHz repeater. With the financial assistance of the UCLA Office of Instruction, we were awarded some money to install a satellite station for OSCAR. Disaster struck! All the radio gear of the Club station was stolen, except the Heathkit SB220 linear and the antenna. W6YRA was silenced for almost two years. During the Santa Ana condition, the wind caused the brake in the beam rotator to break. Consequently, all the cables from the 4-element quad broke. With the help of Rocco (N6KN) and Ken (WA6DPQ) who rebuilt the quad in the 1970’s, we took down the quad and the 2-el. 40-meter beam, and replaced them with a new Telrex tribander. The beam weighed over 60 lbs. It was a major operation. Hats off to Rocco and Ken! Thanks to the Summer Olympic Games which was held on campus. Bob Henry, the director of the UCLA Recreation Association, decided to give us money to reactivate the station so we could participate in the international communication activities during the Olympic Games. We bought a brand new Kenwood TS830S with the help of Al Friedman (K6YRA) who was the manager of HRO in Van Nuys, and a former Club member. W6YRA was back on the air two weeks before the start of the Olympic Games! During the games, we were on the air everyday relaying messages for the athletes, and reporting the results of competitions to various parts of the world, particularly the People’s Republic of China. 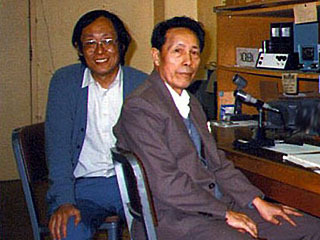 We were in radio contact everyday with Chinese amateur radio stations BY1PK, BY4AA, BY5RA, and BY8AA. They told us that our reports of the results of the sport events were much faster than those of the Chinese Press. Pat Kudo (N6GTU) became our Club President. He designed and built a 440 repeater, and obtained a frequency-pair for W6YRA. The repeater had a phone patch and a 2-meter remote. Instantly, almost all the Club members became hooked in using the repeater. There were no cell-phones at that time. So the Club repeater was very active.